The Temple Mela-gopuram, a massive structure of nine storeys, is a striking landmark for many miles around both by land and sea. It is about 137 feet high above yāli-mattam, over a ground-floor 90' feet long north to south and 65-1/2 feet broad east to west. The finials stoopis at the top are nine in number in consonance with the number of storeys as a general rule with such temples. They are of plaster and stucco, 7 feet, 6 inches in height; and placed over a pedestal base 5 feet wide and 45 feet long. The location of his principal gopuram on the western side of the temple instead of on to the east as is usual to mark the entrance of any temple of importance, is possibly to wisely take advantage of the hardened sandstone rocks and the cliffs nearby to place its large foundations. 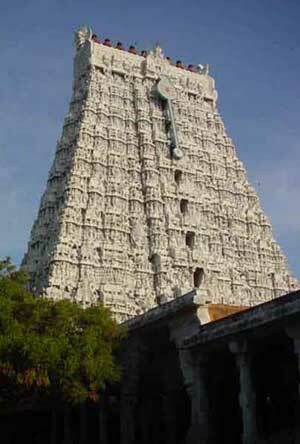 The gopura is said to have been constructed about 300 years ago by Desikamūrti Swāmi, an Odukkath-Tambiran of the then Mahā-sannidhānam of Tiruvāvaduthurai Mutt. He is said to have received his call for the purpose from his place in the mutt, the Lord having communicated His desire both to the Mahā-sannidhānam and the Tambiran in a dream. The latter had no funds for such a huge task entrusted into his hands, but had appraised him of the solution. He undertook it. It is said the labour paid for by the Swami was in the shape of pinches of sacred ashes (tirunîru) placed in the hands of workmen after each day's work, with instructions to open near the Thūndu-kai-Vināyakar Kovil. And those pinches of sacred vibhūti were converted into cash enough to recompense their individual exertion, actually performed during the course of the day! It is remarkable that from the sixth storey upwards to the ninth, the plaster on the walls have kept remarkably on, and they are beautified with fresco paintings! The scenes depicted are from the life of Saint Manikavāchaka, with labels in Tamil and those of the Pandya Ninracîr Nedumāran and his times and also scenes from Tirunelvēli Purānam and many others. A good many of them are obliterated with age, dust and whitewash. As illustrating the contemporaneous state of society they are well worth a study. On the ninth storey is fixed a huge bell kadikāra nālikai mani placed under the orders of one Mr. Eden (possibly the Collector of Tirunelvely from 1832-1839). The clock formerly struck the hour of the day with a mechanism, now in disrepair. The inscription in Tamil found on the bell relates this to be a gift of Tiruppani Vicāranai Stalattār. 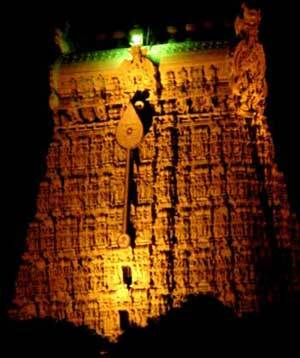 There is a tradition that when this clock struck at mid-day, the call was taken up by a series of bell-fries on mantapas, said to have been built by the Panjalamkurichi family, at regular intervals between Tiruchendur and Ottapidaram. In all of them drummers were stationed to communicate along the route and as far as the residence of Kattabomma Nayakkan the Poligar [somewhat after the style of the signals which conveyed across the Aegean the news of the fall Troy] the actual performance of puja in this temple. At his signal, Kattabomma turned his thoughts to prayer before he took his daily meal. A square mantapa in front of the Pillaiyar temple at Palaya-Kayal, one of such a series, is said to have been built by this family. Similar mantapas exist at Mukkani and Arumuganeri.